The Audi TT (MK1 1999-2006) dashboard / instrument cluster has an LCD central display screen which is quite common to fail. This centre display can become distorted, pixelated or even fail completely. Also, the fuel gauge is another common failure on this type of instrument cluster – giving incorrect readings or even sometimes no reading at all. These instrument clusters can be a very costly replacement and are key-coded so if you are replacing the unit, they will require programming in. Our in-house own unit repair solution means you can avoid all these expensive costs by having your own unit repaired. Your unit will be returned with our lifetime warranty. If you have a faulty dashboard / instrument cluster (speedo) then contact us today by sending an email or call us on 0844 847 9999. Tags : Audi TT Centre Display Not Working - We Can Repair It!, Audi TT Cluster Repairs, Audi TT Dashboard Display Not Working - We Can Repair It!, Audi TT Fuel Gauge Not Working - We Can Repair It!, Audi TT Instrument Cluster Faults Repaired. 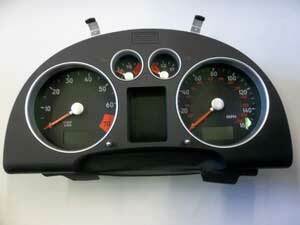 Hi i have a audi tt mk 2 2010 petrol gauge showing halfe full when empty price for repair. Roy. I have sent you an email with the full information and pricing to remanufacture the instrument cluster on your 2010 Audi TT. I have sent you an email with full information and pricing for the testing and repair of this part. I have 2004 mk1 audi tt, central display is faded and odd line in it. how much to repair and check fuel gauge at same time ? My centre display is missing lines. How much to repair? We can definitely help to get the cluster working properly again for you. I have sent you an email with full information and pricing. If you have any further questions, please reply to the email and we’ll be happy to assist you.